Britain has a long history of industry and while modern technology has largely dissolved many smaller companies, there has been a recent resurgence in the use of hands-on manufacturing techniques. In our Made in Britain series, we celebrate the best of British craftsmanship and skills. Daniel Harris of the London Cloth Co is a completely self-taught weaver. He had never even seen a shuttle loom before he bought his first eight years ago – a rusting, Victorian relic that he rescued from a derelict barn in Wales. Slowly acquiring more and more looms, he had to learn by trial and error how his collection of 'unwieldy beasts' work – each an amalgam of at least two machines that he had to carefully disassemble, assemble, replace components and then crank back into life. 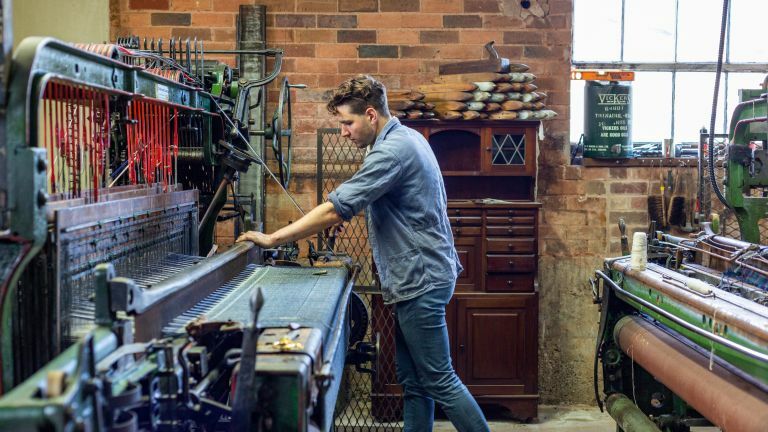 From his micro mills based in London and Worcestershire he now produces a range of bespoke upholstery and furnishing fabrics – from rope-dyed plain, herringbone and twill indigo cottons, to multi-hued woollen heritage tweeds, tartans and blankets. Here Daniel explains the traditional skill of loom weaving. While Daniel is keen to stress that his oeuvre is not a craft – 'these machines were at the forefront of the industrial revolution; in their day they were seen as killing craft,' – there is no denying there is the same crafting ethos in how this one-man mill operator has a hand in every single stage of the weaving process.